Soft or firm, upright or reclined—when it comes to comfort, everyone's unique. With a variety of cushion types and sit profiles, we invite you to define your perfect sit. but one that’s not stuffy or predictable. This soft, plush, and luxurious cushion has give. High loft creates an elegant look with regular fluffing. Sink into Maxwell, Caitlin, or Rose. This soft, but supportive cushion invites all-day lounging. A casual profile works well in informal settings. Lean back with Jasper, Charly, or Henry. 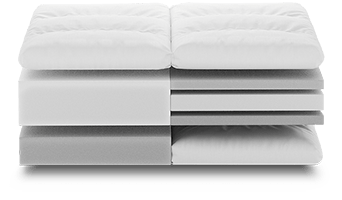 We construct our cushions with high-quality, high-density foam and down — proportioned specifically for each collection. As with everything we offer, cushion comfort can be customized. Our “standard” and “upgraded, extra soft” cushion options are two of the most popular, but we offer extra firm options as well. It’s what’s inside that counts: our foam has passed the highest standards for safety and flammability. We work with a down supplier who certifies its sourcing practices are humane. Your style: crisp, clean, and a little bit modern. This structured cushion is supportive, but still relaxed. Sharp right angles give an overall clean appearance. Relax with Asher or Owens. statement—in an understated sort of way. High-density foam and/or down top a base of springs. A tight seat cushion means no fluffing or rotating needed. Kick back on Gray, Crawford, or Ms. Chesterfield. Do you prefer something upright, or reclined? The answer can depend on your height, whether you have kids, and how you spend your time on your sofa (work from home, Sunday nap, or a little of both). We’ll help you find the right fit. Our medium-depth sofas keep you vertical, yet relaxed. The dimensions are our most universal, suiting a range of heights and body types. For maximum lounging, choose a deep seat—we have options up to 48 inches. Add lumbar pillows to bolster little kids or shorter adults. Our 38 performance fabrics feature soft, but sturdy synthetic fibers and high rub counts, so you can play and cuddle without stress. Tight, flat weaves resist snagging from claws and paws.